TouchOSC makes an appearance as musicians hack control at our Handmade Music Open Lab in New York Saturday. Photo by Matos; used with permission. See his (not entirely safe for work) art portfolio. TouchOSC has become something of a standard on iOS for touch control, thanks to desktop editor apps for custom layouts and high-contrast, Lemur-style controls. Last Thursday was all about wired MIDI on iPad, so it seems only fair to show what people are doing with wireless and OSC. I’ve got a few good selections from my recent inbox. It’s got some extensive functionality, and since Milos used Pure Data (Pd) to translate to MIDI, you can use it with both the Mac and Windows versions of Traktor. Milos doesn’t yet have an iPad, so he’s collecting money to invest in one. Arovia has their own Traktor layout, aptly titled “nano” as it’s fit into a small area. From over the summer, here’s a different approach to using Traktor with touch, turning instead to one big wheel. Malaventura has assembled a “kitchen sink” approach to working with Ableton Live, with a do-everything Live template. It’s a really involved set of layouts; it’s not quite as sophisticated as something dedicated like Touchable, but then again, since you can run both, you may just give it a try and use it for certain editing workflows. The one caveat – and this is a catch on a lot of these patches – is that you need Osculator in order to use it. More on that gripe in a moment. Last week, I showed my preferred means of editing MIDI devices – using, you know, MIDI cables. But I can see the appeal of wireless control, too, in certain situations. Using The Missing Link wireless hardware adapter (see our detailed look at two wireless solutions last month), you can work with conventional hardware. Via Matrixsynth, there’s a nice template for the Waldorf Pulse. The lack of native OSC means way, way too many kludges. Osculator is a cool little app, but you shouldn’t need it to do OSC; the whole point of OSC is that it’s a simple, universal networking protocol. We either need native support in apps like Ableton Live, or we need to use something else – period. 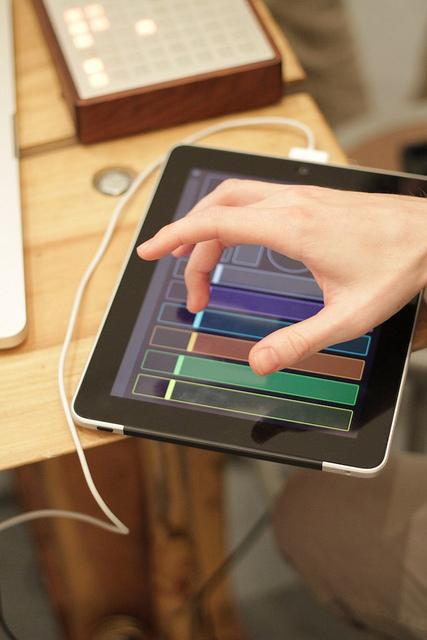 Having to use go-between apps makes it a step backward in these applications from MIDI. Why not edit on the device, or even generate layouts automatically? Part of the beauty of touch layouts is on-the-fly controls. There’s plenty to explore here, from layouts that generate automatically after an exchange of information over OSC to on-device editing. One of my criticisms of the original Lemur was having to use a dedicated editing app, and that was more than five years ago. Why not use the browser? Wouldn’t it be great for editing and control to move seamlessly between desktop browser and mobile, or between mobile platforms? Also, in answer to everyone griping about a good Android solution, I’m personally waiting for a usable Android tablet and not just handhelds. That means I’m seriously bummed that the Motorola Xoom may cost US$800. Sorry, at that point, I spend money on synths instead. All of that said, I do think there are some great solutions here, and they work right now. Looking forward, we can build the next generation even better. What layouts are you using? Got any you want to share? And what do you want to see in touch controllers?